Get behind the wheel of a 4x4 Jeep and explore the natural scenery of countryside Ireland. Steer, jump and skid your way through an obstacle course tailored to test even the most confident extreme driver. Classes begin with a 10 minute introduction before an instructor leads you onto the track. This duration of this experience is approx. 1.5 hours. Expert in-car tuition is provided. Minimum participant age is 18 years. Only 3 participants plus the driving instructor are allocated per vehicle. This experience is weather dependent. Not suitable for people with back problems. This voucher is valid for 2 people. Provisional driving licence is necessary. 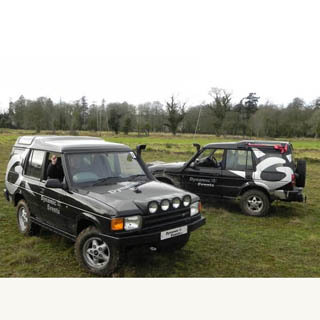 Off Road Driving is located at Killashee Off Road Driving Centre, Naas, Co. Kildare. Classes are run primarily on Saturdays at 9:00, 11:00, 13:00 and 15:00. Advance booking on AllGifts.ie is required. Classes are run on Saturdays at 9:00, 11:00, 13:00 and 15:00. Advance booking on AllGifts.ie is required. Palmerstown House Off Road Driving Centre, Johnstown, Naas, Co. Kildare. Off Road Driving offers you the most adrenaline fuelled driving experience of your life. Enjoy our 4x4 course which was made specifically to challenge the most extreme drivers Ireland has to offer. With 17 years of experience in the industry, Off Road Driving offers you the most fun filled action packed extreme 4x4 course, tailored for any adrenaline junkie interested in pushing their driving skills to the absolute limits. 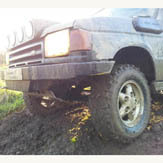 Show off your off-road skills at the Off Road Driving’s private track located just outside of Naas. How it Works: Use this gift voucher on AllGifts.ie to make a booking with Off Road Driving. Or you can swap this voucher for any other gift or voucher listed on AllGifts.ie. Simply follow the instructions at the bottom of your voucher.